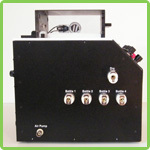 The AUC Cell Washer is a simple, stand alone, fault tolerant device for washing AUC cells without time consuming disassembly and reassembly. Each Cell Washer includes an electronically-controlled air pump for automatically drying the cell. Reproducible cell washing, rinsing, and drying protocol. Cells remain assembled, and are less likely to have leaking problems. Able to leave sample in one channel and only change sample in the other channel. Remove fill hole screw and gasket from channel to be cleaned. Leave fill hold screw installed in side not being washed. Install cell adapter in cell fill hole side to be washed. IMPORTANT: for proper installation, the fill hold to be washed should face toward the back of the Cell Washer, toward the cell sensor post. In order to wash the second channel, the cell must be rotated end for end. The reason this is necessary is that the fill hold angle is not along the radius of the cell but at a slight angle. Close the cover (activates the cover sensor switch). Select the desired wash and dry times from the rotary selector knobs on the front control panel. Make sure the drain tube is directed into an appropriate waste disposal container. Press the START (black button) on the front control panel. Once the wash cycle ends, the air pump is activated to dry the cell. This is NOT the end of the cycle. After the air pump is finished, the system is then purged using water (from bottle 1). This clears any solvent from the tubing that is left from the last washing step. This ensures the next time the washer is used, the first fluid introduced to the cell is water. If enabled, the alarm will sound at the end of the purge step indicating the end of the cleaning cycle.